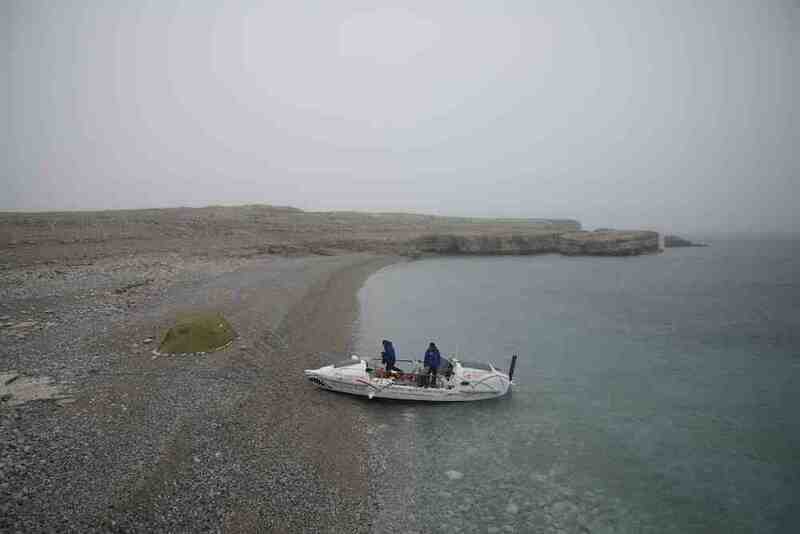 Sandbars guard the exit to Paulatuk and prove to be a headache for us on the row out of the community. We make a five kilometre detour before setting our heading to the far eastern shore of Darnley Bay and Cape Lyon beyond. 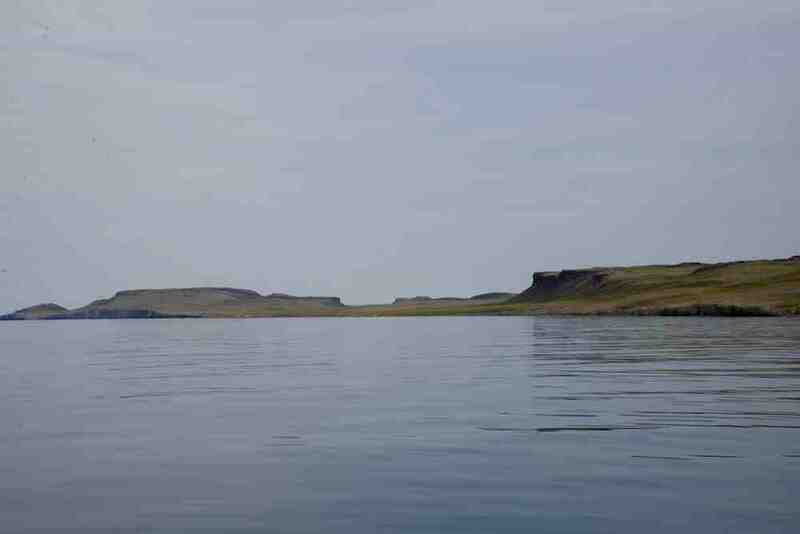 We row into the deep waters with the intent of cutting a large corner of the bay with a traverse. The idea quickly shows its weaknesses. This direct route to the far shore is shorter in distance than one more closely following the coastline but this direct route also exposes us to more risks. Travelling further out in the bay means water depths too deep for our ground anchor. If a wind starts pushing us where we don’t want to go we’ll be limited to our sea anchor to slow us down. We discovered the hard way in Sellwood Bay that our sea anchor still allows significant drift enough so that in a twelve hour blow we’d be right back where we were three days ago. We make the difficult decision to head closer to shore, to take the longer coastal route in shallower water, so we can better control our movement. Our decision proves to be a good one as the next 24 hours has us deploying our ground anchor twice, both times to halt the aggressive push of a 20KN south easterly that would have blown us right out into the middle of Darnley Bay. The wind eventually dies down long enough for us to row continuously to Cape Lyon, a 24 hour burst that claws back some lost time. 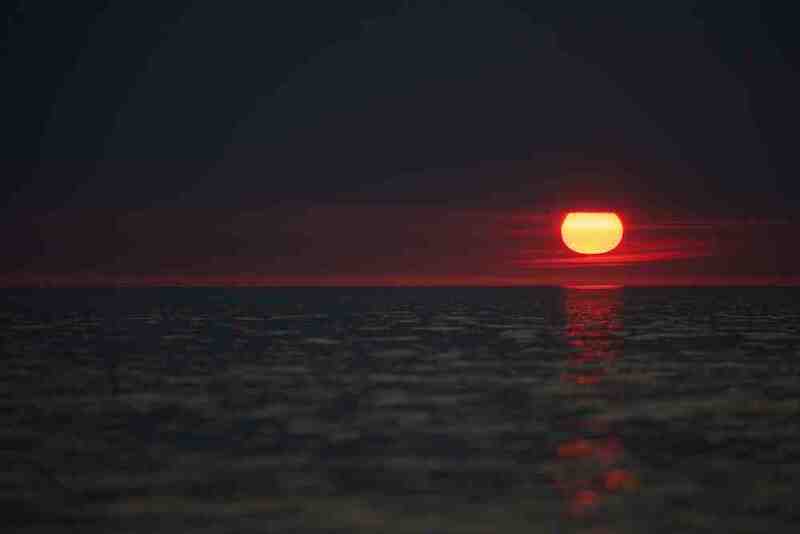 The calm seas help us in our data collection duties as well. We’re teamed up with the Vancouver Aquarium and the Department of Fisheries and Oceans and they have tasked us with collecting ocean data along our route so that ocean scientists might get a better picture of what’s happening to the waters of the North West Passage. We use a special device called a CTD that measures a host of different ocean characteristics including conductivity, temperature and depth as the acronym indicates. The Department of Fisheries and Oceans has very little CTD information across the passage making our data collection a very valuable endeavour. Understanding what’s happening in the arctic ocean will help better understand what climate change is actually doing up here. Deploying the CTD is a fairly straight foreword process but is one that still requires effort and commitment certainly from rowers who often have their hands full with more pressing issues. The device itself is roughly 3 feet long and 4 inches in diameter and has a number of black rubber hoses emanating from the white cylindrical body. 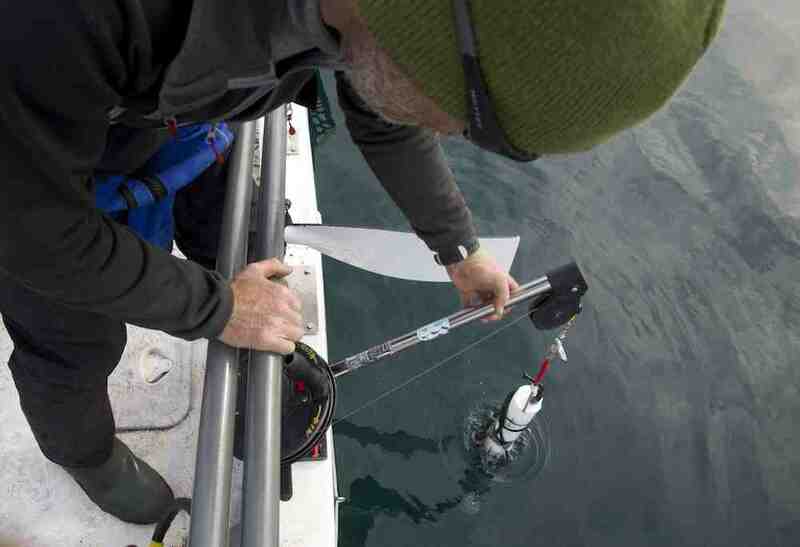 The CTD is attached to a down rigger and is steadily lowered to the ocean floor, a five pound lead ball attached to the underside to facilitate a smooth decent in the water, and is brought up again. This is done twice. All the data is stored in the device but routinely is downloaded to the computer to ensure nothing is lost. We try to take measurements once to twice per day. I’m one of those guys who absolutely hates shopping, never have liked it and probably never will. However the time we spent in the Northern Store in Paulatuk was probably the most enjoyable shopping experience of my life. The “shore food” that we added consisted of lunch’s and dinners (we have enough breakfasts on board). For lunch’s we have some meat and pasta or meat and potato dishes that you simply add boiling water to. For our dinners, we got some spaghetti and meat sauce which again is simple to prepare. Being Irish myself and Denis also bought a bag of spuds (potatoes) and we have some mayonnaise and cheese left over from Paulatuk so this can be added into the mix at some point too. I also bought a bag of march mallows for fire toasting at some point. Obviously it would be great if we never had to use this shore food as it would mean we are constantly moving but considering we just had our first shore meal, it was probably a good call. We’ve added in one extra meal into the our daily menu now which will be a bowl of noodles – we have chicken and beef flavours. So in total now we have four meals a day each – porridge for breakfast, two freeze dried meals and a bowl of noodles. In between we have also have half a bar of chocolate and a choice of either a power bar or a pop tart per day per man. Each of us also bought whatever extra’s we wanted. We all bought a 700g bag of nuts that we can dip into. Myself and Denis decided to make up 20 little “treat bags” so we each have one of these per day for 20 days (or however long we can make them last). In mine I have some additional nuts, a few jellies, some skittles, one jam biscuit (to have with the cup of tea) and a few crackers. We also bought more coffee, sugar and coffee mate. In an effort to make the coffee mate last longer, we agreed to start using a spoon rather than just pouring it into our cups. So we each get one spoon of coffee mate per hot drink we have. We got the hazelnut flavour too which is delicious. All in all I think we’re in good shape on the food front for the next month or so. The ground anchor we picked up in Paulatuk is working well. This is something we will need to use regularly for the remainder of the trip and is quite important. I had stupidly burnt one of my socks while drying it near the fire a few weeks ago so I bought another pair of warm socks which means I now have 3 pairs. One that I row in, one dry pair to keep for cabin wear only and then a spare pair for when either of the other two gets soaked (as will happen at some stage). I also bought an extra pair of gloves to keep the paws warm when on land. We all have neoprene gloves to keep our hands warm when rowing and these work well but having a dry pair for time on land will be a big help. I did have another pair but they weren’t great so I’ve upgraded a bit. So that’s the end of my shopping for a month or so. Time for a coffee now before hitting the oars……. It’s not long after leaving Brown’s camp that the wind builds again. It’s a tune we’re familiar with now, moving forward until we can’t, finding a suitable lee, setting up our Helsport tent, waiting until the wind dies again. It’s hard to underestimate how frustrating this is for us with even a moderate headwind stopping us in our tracks. If we had kayaks now we’d forge along at 4 to 5 kmph but we don’t and stop we must – Quinuituq. Eagerness to keep moving aside, tent time is a nice time for us. We pass the hours waiting on the wind playing cards (hearts) and chatting about where we are, what we’re doing and the food we miss. We keep the discussion of missing our families to ourselves. Sleeping in polar bear country is a little different than the norm. You sleep with a shotgun. The gun made me uneasy at first – I’m a big city kid from Montreal and have had little exposure to firearms – but I find myself fairly complacent now. Our 12 gauge rests at my feet, tucked up beside Denis’s head. There are no cartridges in the barrel, just in the chamber, and the lock is on. Potentially deadly but currently benign, we fall asleep easily. Over a decade ago I heard about a Vancouver based kayak team attempting to paddle the Northwest Passage. 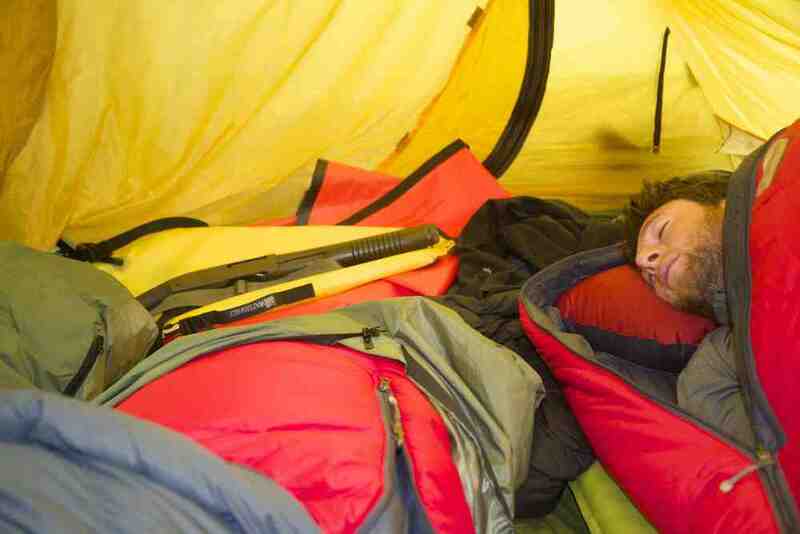 Early in the trip, while camping on a beach, a polar bear leaped on their tent and mauled them. They were able to get a shot off in the mayhem, missing the bear but scaring it off, and had to call for rescue. During the ensuing wait, with one of the paddlers badly hurt, the polar bear remained close by, weighing its chances on another assault. Strangely enough I feel no anxiety when sleeping here. We’re prepared for the things we can be, we don’t worry about things we can’t. The wind holds strong for the night and is kind to us in the morning. We row continuously for the next 27 hours with little interference and glide into Paulatuk at 13:00 on silky smooth seas, a cloudless, pastel blue sky our welcoming reception. Readers may wonder how we’re able to communicate from one of the remotest places on earth, uploading blogs and images daily to our website and the Vancouver Sun. Well, it’s all done through satellite technology and a healthy dose of patience. ADAIA Communications is instrumental in making our communication system what it is. They’ve helped us pull everything together and make what can be potentially a very confusing setup into something that’s easy to figure out and runs smooth. 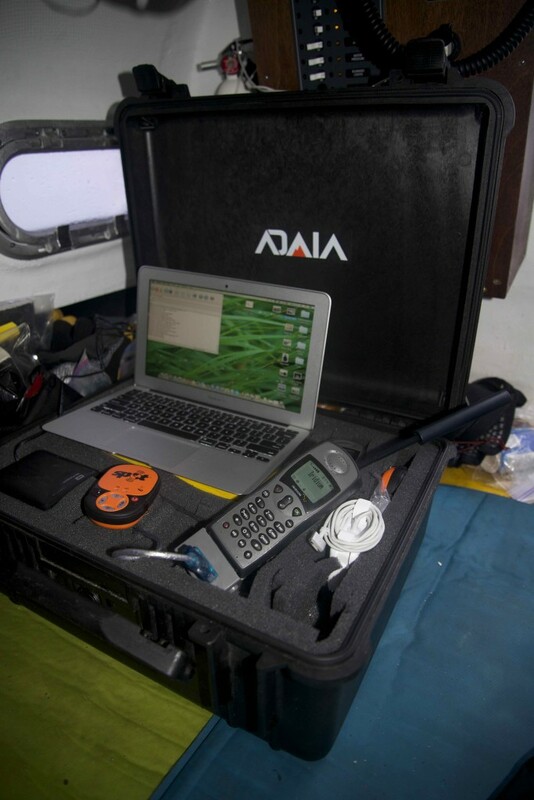 The key to the whole system is the satellite phone and we’re using an Iridium 9505a model. Iridium has excellent coverage throughout the arctic and was the right choice for us. Our computer is a Macbook Air laptop that’s compact and durable, with a solid state drive – no moving parts to break. All our blogs are written on this and all are images are uploaded to it too. To make transfer easy from the computer we have a small wifi hotspot connected to the phone via a special connection device and cable. The wifi hotspot called the Optimizer has special drivers that take information received from the computer and process it so it can be sent as data through the satellite phone. It works like a charm. We use a special email account through Ocensmail that facilitates connectivity through satellite phone. It monitors file size and allows files to be uploaded and dropped (happens all the time with a sat phone) and then to restart where they were left off. This is a very important point as some file scan take 20 minutes or more to upload. Having the call drop at minute 19 and not restart at this point can be extremely disheartening. Sending text files is easy to deal with as they are small in size and can be cut and pasted into the body of an email but photos are a different beast altogether. The image size captured on our camera a Canon D600 is 24MB (24,000kb) per image. The realistic maximum size of photo I can send via a satellite data connection is 50kb. Needless to say some serious resizing needs to be done. I could send larger files but wait times would be onerous. As it stands a 50kb file will often take 15-30 minutes to be processed and sent across. This is why we don’t send lots of images and can’t send video. The entire communication system is charged by a 12V battery that is being perpetually charged by solar. With 24hr daylight, this is proving a very good system. Readers who have been following us on our website will have seen that we have a dynamic mapping program connected with Google Earth that shows our location as we move. This is done through a small device called a Spot checker that transmits our location via satellite. It uses minimal battery power and just runs away in the background keeping track of we’re going. It has an SOS component to it too.